Question: Does Buffalo Bayou use a researcher or research firm to quantify the bat colony and birth seasons? Answer: I have been researching and managing the Waugh Bat colony since 2003, working with staff from the City of Houston Parks and Rec Dept. and then Buffalo Bayou Partnership when they began managing Buffalo Bayou Park. I work with a very dedicated and skilled group of trained volunteers, The Houston Area Bat Team, to continue that bat management and research. Our team has several partners – Buffalo Bayou Partnership, Texas Parks and Wildlife Dept, Bat Conservation International, The Houston Zoo, Houston Parks Board, and Texas Master Naturalist Program (3 chapters). Early on in 2005, we began conducting crevice counts (estimates of the number of bats residing in the crevice space). Pre-Harvey, that number was 300,000 bats. Because the City of Houston was planning to promote the bat-watching opportunities at Waugh, we wanted to learn everything we could about this bat colony, including bat behavior, seasonal changes, and nightly emergence behavior, to make sure we didn’t impact the bats with our public viewing efforts. During our research, we observed pups (baby bats) in the bridge crevices, so we dedicated considerable time and effort to document seasonal bat activities and timelines. For example, the pups are born at Waugh starting the end of May through June. Each female Mexican free-tailed bat gives birth to just one pup per year – all during this time. The oldest pups begin practice flying during the first week in July. All of the pups are flying by the end of August. Question: Is the colony expected to return to more than 300,000 bats? Do you think this will happen in 2018? 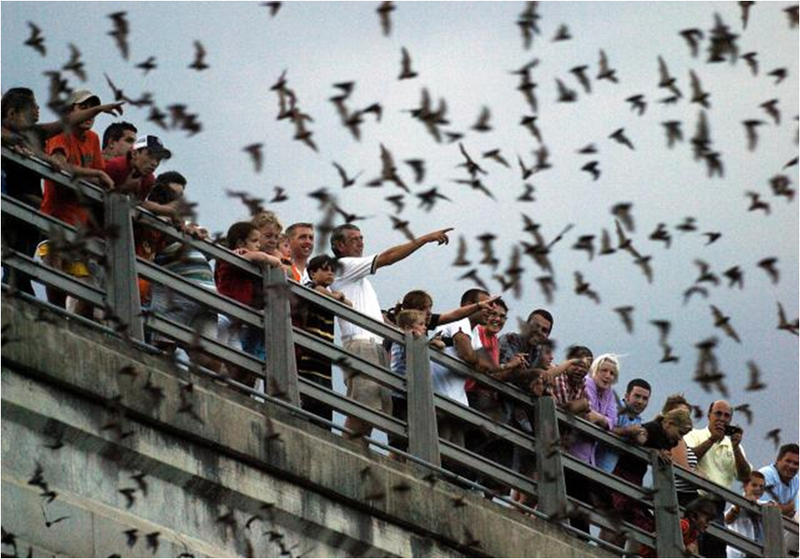 Answer: I have been amazed by how quickly the bats have returned to Waugh bridge after Harvey’s impacts. In talking to residents who live near Waugh bridge, and listening to what they observed during Harvey, I believe more bats managed to escape the flooding than we originally thought. The population now, with some of the pups flying, is 200,000 or more. So it won’t take much time for the population to reach pre-Harvey numbers. The emergences this month have been really spectacular. By summer 2019, I predict the population at Waugh will be back to pre-Harvey estimates…as long as we do not experience another Harvey in the meantime. Question: What is it about Waugh Bridge that attracts so many bats? Answer: The Mexican free-tailed bats choose Waugh bridge due to its structure, location, and warmth. The bridge beams underneath are installed one next to the other, with narrow crevices in between. The crevices are where the bats roost, hanging by their toes from the concrete crevice sides. The concrete holds warmth. When the pups are born, they are hairless – just tiny pink babies, like a human baby. They rely on body heat AND the concrete heat to keep them warm until they can grow fur. The bridge is located over water. The water cools the air in the summer, retains heat in the winter, and provides water and insects for the bats. [These bats eat an estimated 3 tons of insects each night.] Houston’s bayous are beautiful and full of life – for all kinds of wildlife, both large and small. Because Houston and Waugh bridge stay somewhat warm in the winter, there is a population of Mexican free-tailed bats that live in Waugh through the winter. We don’t know if the ‘winter’ bats are the same individuals as the ‘summer’ bats. Each bat eats enormous amounts of insects and stores fat all through the spring and summer. When the temperatures get too cold, below 50 degrees F, the bats remain up in the smallest crevices and live off their stored body fat. But if we get warm weeks in winter, with insect activity, then the bats emerge and fly. So Waugh bridge is a year-round bat-watching opportunity, depending on the winter temperatures. Waugh bridge bat colony attracts visitors from all over the world. The Houston Area Bat Team gives Friday Night “Bat Chats” down at Waugh Bridge 30 minutes before sunset on Friday nights (starting first Friday in March through last Friday in October). The bat emergence usually begins around sunset. We usually gather at the southeast corner of Waugh Drive @ Allen Parkway. There is a bat viewing platform there. Watch the Waugh Bridge Bat Colony emerge every evening, all year round, 15-30 minutes before sunset.